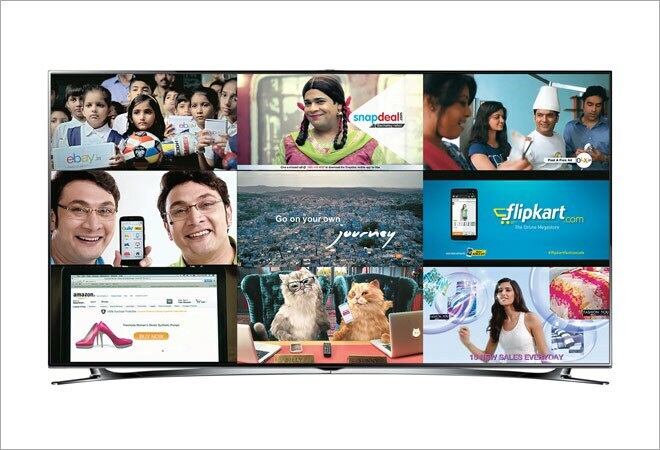 Are e-tailers going overboard on TV advertising to get more visibility? E-tailers are going on an advertising overdrive on TV to ensure more visibility for their brand. During the recent Navaratri festivities, a character in a popular fiction show on Star Plus, Yeh Hai Mohabbatein, was shown shopping online for gifts for her family. She buys a piece of jewellery for her daughter from Amazon, the online retailer. She goes on to educate her daughter about the various facets of online shopping - ease of shopping, cash on delivery and so on. All this was woven into the script of the show. Similarly, the contestants of reality show Bigg Boss, on Viacom 18's general entertainment channel Colors, were seen buying household items such as refrigerators, microwaves and mattresses on Snapdeal.com's Diwali Bumper Sale. Indeed, as these examples illustrate, e-tailers such as Amazon, Flipkart and Snapdeal, are spending a fortune on television advertising. This is a throwback to 1999-2000 when dotcoms had raised a lot of money from venture capitalists and were spending heavily on advertising. The advertising splurge this year is also because it is now a three-way fight to be the dominant e-tailer in the country, and all three - Flipkart, Snapdeal and Amazon India - have deep-pocketed backers who are going all out to win this battle. Broadcasters claim that e-tailers have been one of the largest contributors to their advertising revenue this year. 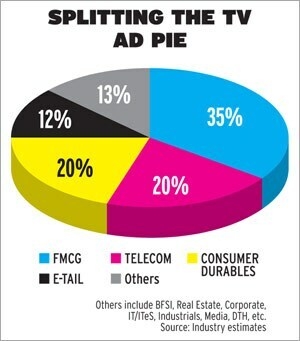 "From just four per cent (of total advertising spends on TV) last year, advertising spends of e-tailers has gone up to 12 per cent this year, making them the third-largest spenders on television," says Rohit Gupta, President, Multi Screen Media (MSM), which runs the Sony channels. The largest contributors continue to be fast-moving consumer goods (FMCG) companies with spends in the region of 35 to 40 per cent of the total advertising pie. Telecom and consumer durable companies contribute around 18 to 20 per cent each. A 10-second spot on Sony's game show Kaun Banega Crorepati costs around Rs 6 lakh and Snapdeal has gone in for an in-show integration. It has a Snapdeal-branded question on the show for which it would have to pay a premium of anywhere between 25 to 30 per cent. "E-tailers are increasingly opting for in-show brand integrations. In Bigg Boss for instance, we even had the Snapdeal delivery boys coming into the Bigg Boss house and delivering the merchandise," says Simran Hoon, National Sales Head, Colors. Snapdeal's marketing spends have shot up in sync with the multi-fold growth of the business. These kind of integrations convey the message that shopping on Snapdeal's online marketplace is convenient with a wide variety of products available, says Sandeep Komaravelly, Senior Vice President, (Marketing), Snapdeal. T. Gangadhar, Managing Director of GroupM's media agency MEC, says that e-tailers spend on above the line advertising is justified, especially at a time when they are looking at smaller markets. "The next wave of growth will come from smaller towns and television and print platforms are the best way to reach out to these consumers," he points out. A typical brick-and-mortar retailer, such as Big Bazaar or Reliance Trends, advertises aggressively only during festivals. However, analysts believe that e-tailers, like the FMCG companies, will continue to advertise round the year. "Advertising becomes crucial for an e-tailer as that's the only way it can make its consumers aware of its products. They are not brick and mortar stores where one can walk in and touch and feel the products," points out Jagat Dave, Managing Director at Ambit Corporate Finance, an investment bank. Not all e-tailers are going overboard on advertising. eBay, which has been around for nine years in India, doesn't feel the need to splurge on television. "There was an era where people needed to be educated about online shopping. But I think we've passed that phase and now it's more about how you convert people who are already online and make them online users," says eBay India's marketing head, Shivani Dhanda. In fact, Devangshu Dutta, CEO of retail consultancy, ThirdEyeSight, believes these e-tailers are splurging because they are flush with cash. "They have a lot of capital and they are trying to grab as much land share as quickly as possible. So, they are trying all kinds of advertising and are hoping it works." How long will the e-tailers be able to sustain their advertising spree? Ambit's Dave expects ad spends to increase because, he says, investors in e-tailers have also budgeted a huge amount for advertising. But not everyone agrees. Snapdeal is known to have posted a loss of close to Rs 300 crore in the last quarter itself and the financials of the rest of players are supposed to be no better. A lot will depend on whether these companies will continue to get as much funding from venture capital funds and private equity players as they are getting now. Clearly, if they continue to rack up losses, funds are bound to dry up and so will advertising.